Chung made the request during a meeting with French Prime Minister Édouard Philippe on November 3 during the latter’s official visit to Vietnam from November 2-4. He informed the French PM on Hanoi’s cooperation with French enterprises and localities. At present, 102 French investors are running projects in Hanoi with total capital of nearly EUR 300 million. The capital city has signed twinning relations agreement with Ile-de-France and Toulouse city, under which the sides have worked together in culture, tourism and medical human resources. Hanoi also engaged in medical cooperation with Paris, and conducted several joint schemes with the French Development Agency in the preservation of cultural heritage and the ancient quarter, waste treatment, and in fighting environmental pollution and adapting to climate change. The Hanoi leader took the occasion to suggest that Hanoi students be allowed to study at the Lycée français Alexandre Yersin. He also proposed partnership in digitalizing database and building e-government and smart city. He affirmed that Hanoi faces great challenges in development, as it has a big population. 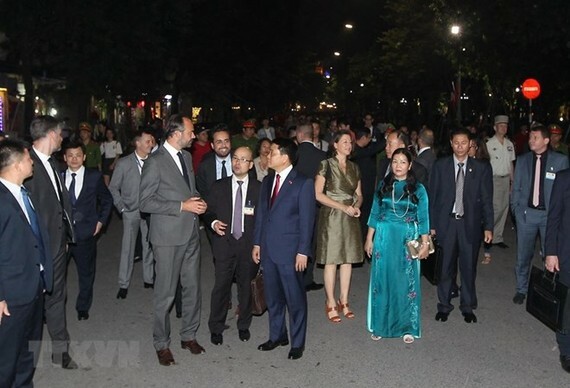 France has many firms excelling in urban management so the two sides can cooperate in this field, he said, expressing his belief that Hanoi will be the meeting point of big projects between France and Vietnam. The PM pledged to do his best to support the cooperation between Hanoi and French localities. Following the meeting, the French PM took a walk at the pedestrian street around Hoan Kiem Lake and visited the Temple of Literature. Earlier in the day, PM Édouard Philippe and his entourage made a trip to the northern province of Dien Bien, where he visited the A1 Hill in the historic site of the Dien Bien Phu battlefield, and laid a wreath at the local cemetery for fallen soldiers. In the morning of November 3, the French PM and Chairman of Hanoi People’s Committee Nguyen Duc Chung cut the ribbon to inaugurate the new facility of the Lycée français Alexandre Yersin in Hanoi’s Long Bien district. The school is a French international school under the purview of the Agency for French Education Abroad.